Join Dracula on his most "chilling" adventure yet as he tries to stop the Ice Queen from turning the world into a giant snowball! The queen wants to rule the world, but first, she has to make it more hospitable for her frosty disposition. You must guide the world-famous fanged one as he follows the trail of icebergs, glaciers and snow zombies the queen leaves behind on her wintry quest. 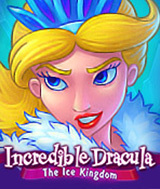 To find the pieces of the mirror and overcome the Ice Queen, you must usher Dracula across his vast kingdom. Using the resources you gather and produce, you'll complete quests for magical creatures, rebuild frozen settlements and race against the timer to earn awards!